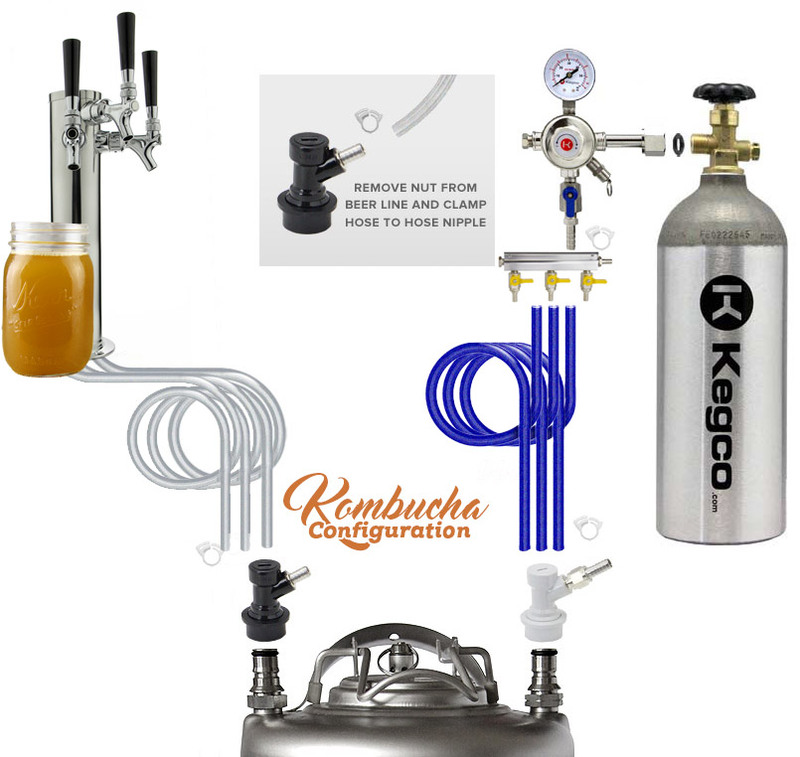 Introducing the KOM20B-3 Three Faucet Kombucha Dispense System from Kegco. This high quality keg tapper comes complete with everything you need to dispense up to 3 cornelius kegs of kombucha, the nutritional probiotic tea that is packed with compounds that support your digestive and immune systems, detoxify, energize, clarify your skin, prevent disease and elevate your mood. Not only does it include all the necessary equipment to pour a cold, healthy glass of 'buch' from three kegs at a time, but this kombucharator can also easily be converted to a regular refrigerator with two adjustable storage shelves. It has a stainless steel interior floor plate which provides durability by displacing the weight of the kegs evenly over the floor of the cabinet and allows you to slide the kegs in and out smoothly. This three product kombucharator comes with a triple faucet commercial grade draft tower and a single gauge regulator with and air distributor set up for three kegs. The Kegco KOM20B-3 is designed for home use so it is quiet and energy efficient. The removable recessed drip tray with a plastic grill can easily be taken out and cleaned in the dishwasher. The attractive chrome safety rail helps to keep mugs and glasses from sliding off and installs with ease. The easy roll casters make moving this unit from your bar to your patio a breeze and they lock to prevent the unit from rolling once you have it in position. The sleek matte black finish complements any decor and does not show fingerprints like a shiny finish might, meaning less cleaning of the outside of the appliance is necessary. This Kombucha Cooler includes a triple faucet draft tower with stainless steel faucets and fittings to ensure a sanitary environment for the live cultures found in kombucha. Also included are three sets of ball lock keg couplers for cornelius home brew kegs, a single gauge CO2 regulator with a 3-way air distributor and a 5 lb Aluminum CO2 tank. One 5 lb tank can pressurize up to fourteen 5-gallon kegs before needing to be refilled. Although everything necessary to tap ball lock cornelius kegs is included, the KOM20B-3 is customizable with many different features. The standard faucets are made of durable and sanitary stainless steel but we provide the option of upgrading to Perlick faucets which have less internal surface area which prevents a sticky faucet knob. The included ball lock keg couplers are food grade plastic and are designed to prevent corrosion, but we also have the option to upgrade to stainless steel ball lock couplers. View the options below and feel free to give us a call at 1-800-710-9939 option 1 with any questions regarding the dispense system.